So what’s that milestone I mentioned? You guessed it. This marks the 3ooth strip I’ve done for Flatt Bear. So to commemorate that feat, I chose a fitting tribute. To give our cast the opportunity to show their inner Spartan… and for Lucy to show some gam. 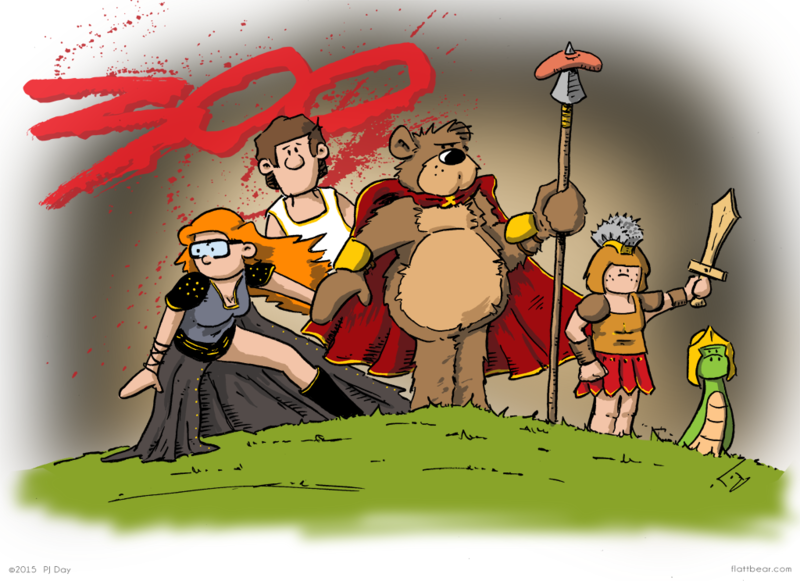 Not only is it strip 300, but it also marks the two year anniversary for Flatt Bear. Well, that actually was last week, but I chose to wait till today to make this all double cool. I just wanted to take the time to thank each and everyone of my fantastic and dedicated readers and followers. Without you, I’d just be drawing a bunch of silly bear cartoons all by my lonesome. You guys and gals make it all that much more fun and worth while. To all those who promote me on Twitter, who check out the strip three times a week, for those who offered up their talents this summer for the guest spots, I say thanks. I honestly didn’t think it would last past a year, and here I am looking at entering year 3. So what’s in store? Lots. I have plans to introduce a few more new characters over the next months and to bring back a few old ones. And I’ve got a few new story lines on tap as well. Remember, North still doesn’t know who his client is. And who knows, maybe we can talk Lucy into a showing a little more leg from time to time. Stick around, it’ll be great. And tell your friends. 300 strips and whatta-ya get… 300 more to go before another milestone! CONGRATS! euugghh. thanks for that uplifting thought. Congrats on 300 strips PJ. I would like to buy this as a print. I think it’s awesome. 🙂 Congrats on reaching 300! Thanks Autumn! I’m really happy how this turned out. I will look into offering this up as a color print. I want one myself. Sorry I’m a day late, but time really slips by when you don’t realize it. 300 strips is a bunch and we’re proud of you. We remember when you couldn’t even write, never mind draw stuff so you’ve done well my son….. The next 300 should be a piece of cake………. I still don’t know how to read or write. I have a bunch of chimps doing my work for me. We’d be doing all our own work. Oh, and you very welcome! Congratulations! And great job on the comic, it’s amazing! Hot Dog! Happy 300th PJ! Congrats on your 300th P.J.! Keep goin’ man! Congrats P.J.!!! 🙂 Great outfits too!